Bulleit Bourbon is one of the top ten selling Bourbons in the United States. Bulleit Bourbon is wholly owned by international spirit giant Diageo. Bulleit was part of the sale in December 2000 when Diageo bought many of Seagram's former Brands. Diageo is headquartered in London, England. Bulleit/Diageo in March 2017 spent $115 million dollars to purchase 300 acres of land just outside Louisville in Shelbyville, Kentucky. That distillery has the capacity to produce 1.8 million proof gallons of bourbon per year. Bulleit Bourbon dates back to 1836 when Augustus Bulleit was a bartender in Louisville, Kentucky and made his mission to craft distill his own perfect brand of Rye Whiskey. His whiskey became a local favorite and was written about on a few occasions in the local paper The Louisville Daily Journal. Legend has said that one spring in the early 1860's that Augustus was escorting his annual shipment of whiskey down to the commerce port of New Orleans, Louisiana and disappeared off the face of the earth. No one knows what happened except that his whiskey also disappeared the same time he did. Speculation has been split between those who think that something nefarious happened to him while others believe that he left his current life without a trace and moved west anonymously to enjoy his masterpiece by himself in retirement. The 9,000 square foot Bulleit Frontier Whiskey Experience at Stitzel Weller in Shively, Kentucky. Over 120 years later his great-great-grandson Attorney Thomas E. Bulleit, Jr. had a dream to bring back his forefather's recipe and in 1987 he contracted with Four Roses distillery in Lawrenceburg, Kentucky. Despite Augustus' whiskey being Rye, bourbon was going through a renaissance in the late eighties and Tom tinkered with the mash bill enough to create a high rye bourbon with about one-third rye. The bourbon was good but the marketing of his bourbon was one for the ages. He packaged his bourbon in an old-fashioned looking bottle and had the words Bulleit Bourbon "Frontier Whiskey" raised in the glass bottle. He slapped on an old label and sold it in a burlap sack with leather drawstrings. He targeted millennial and wrote reviews himself that stated it was a "Rough around the edges" frontier bourbon that was great for mixing in old fashion cocktails. Sales took off and Bulleit became a mainstream brand and is now selling over 800,000 cases per year. The 52-foot Vendome copper and brass still at the Bulleit Distillery capable of producing 1.8 million proof gallons annually. In 2011 Bulleit releases its second version, in a very stout 95% rye mash bill Bulleit Rye Whiskey that was contracted from the old Seagram's plant M. P. G. in Lawrenceburg, Indiana. This Rye has consistently performed in the top three selling Ryes in North America. In 2013 Bulleit introduced its 10 year-old Frontier Whiskey. In May 2015 Bulleit released its Bulleit Barrel Proof Whiskey, a high-strength, limited-edition small batch whiskey comes in varying proofs from 118 to 125. Bulleit maintains that this bourbon was made to be a perfect pairing with Cigars. In March 2017 Bulleit Diageo invested $115,000,000 to build the brand new Bulleit distillery on 300 acres in the Louisville suburb of Shelbyville, Kentucky. 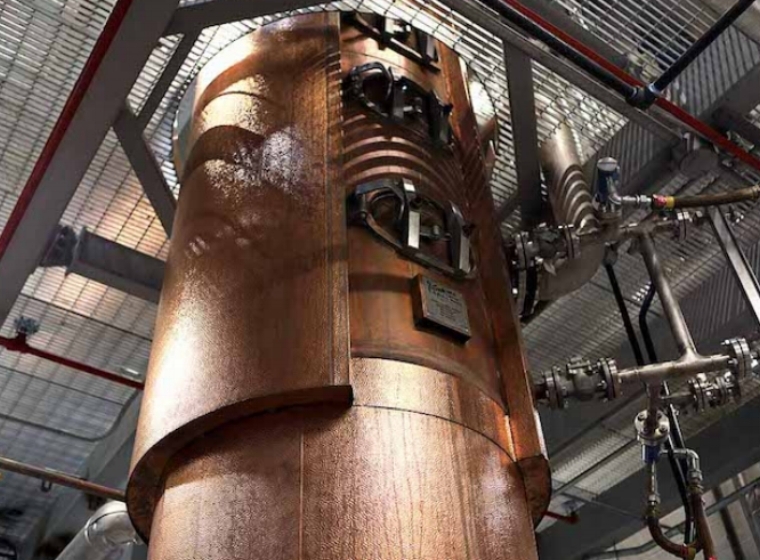 The distillery includes a 52-foot Vendome copper and brass still capable of producing 1.8 million proof gallons annually. Included on the property are six 55,000 barrel warehouses. They also invested $18,000,000 to build the 9,000 square foot Bulleit Frontier Whiskey Experience at Stitzel Weller by revitalizing the old Stitzel-Weller in Shively, Kentucky just outside nearby Louisville. The distillery will not only produce its flagship whiskey being the 4 variations of Bulleit Frontier Whiskey, but it will also produce the old version of I. W. Harper, the top shelf brand of Blade and Bow. It will also begin bottling the limited edition bottles of the Orphan Barrel collection. An artist rendering of the new $115,000,000 Bulleit Distillery in Shelbyville, Kentucky.